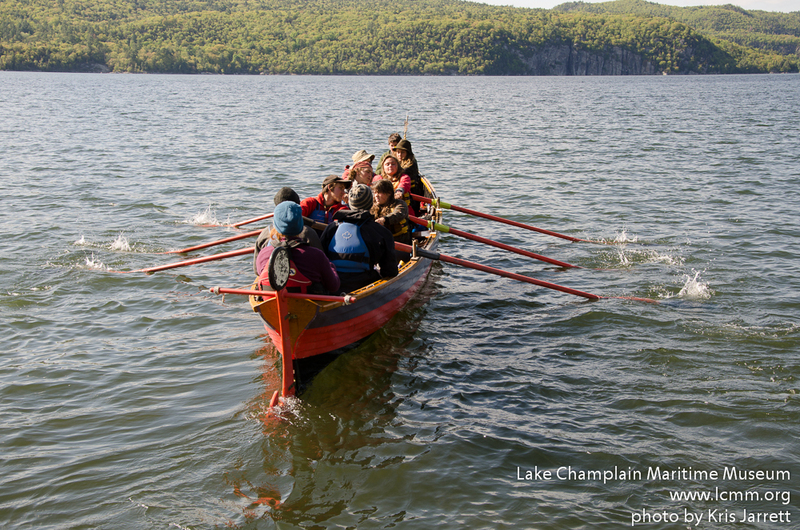 Two weeks ago we canoed to the town of Swanton, Vermont, where we switched to rowboats from Lake Champlain Maritime Museum. 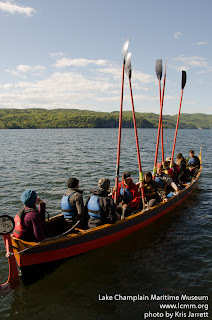 The boats included two fine large crafts outfitted for carrying loads over distance: a six-oared boat, Harvest Moon Sports, with a purple maroon and black paint job with varnished oak trim, and a four-oared craft, American Shad, dressed in canary yellow and blue with no trim and less powerful than her larger cousin in windy waters but an eager match on the flat lake. The boats were given to us with a warning that “it could get rough out there” and that we should take it easy on the windy days. 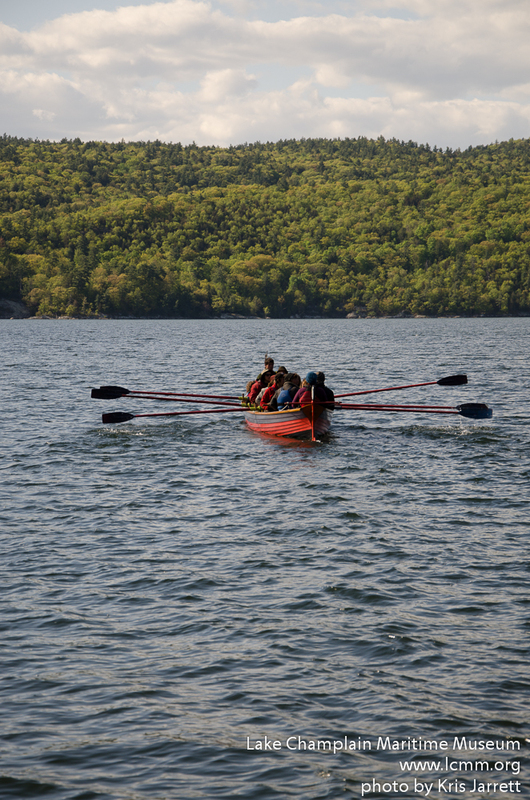 Of all the days we rowed down the lake, only one of them was with the wind. 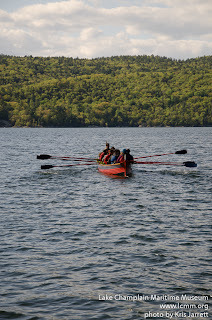 We rowed in merciless head winds and covered good distance as well, despite the “rough winds.” Indeed on our second day of travel, a large windstorm with thunder and lightening hit us, boats tacked against the waves, but we did persevere! That night we slept in a State Park in New York, seeing as we got to camp so late. We slept under a gazebo and awoke to the sight of an impenetrable fog and local people running in the early morning. Although it was called a State Park it was in fact the city of Plattsburg’s newest local park. 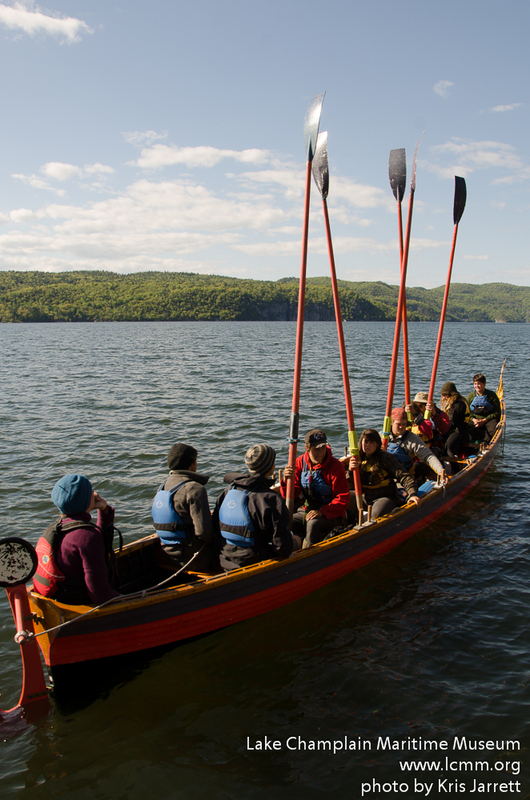 We cast off quickly and rowed into the cloud shrouding Valcour Island, our next destination. On Valcour we learned about a battle that happened between Benedict Arnold and the British. Although Arnold won, he didn’t win by much having saved only four of his 15 boat fleet. Yet it delayed the British from invading the South Bay of the lake for one more year. So the fledgling nation was safe for then. The next day the Harvest Moon and it’s crew were sabotaged by the crew and company of the Shad. They left at first light like thieves in the night, shirking to take down camp, stealing some of our rudder and some of our oar pins as well as breakfast. Wounded and infuriated, the Moon rowed on out and beat the Shad to Burlington despite its handicap. We landed in good spirits on North Beach, a popular little spot, to cook our leftover supplies over a fire grate. Later that day we hauled out gear to the Rockpoint School, which was just up the road from North Beach. The school is an old Episcopalian church, all built out of firestone and mortar. The student body of some 40 kids and staff listened to us talk about our semester and then invited us to dinner, which we of course accepted cordially. What a great dinner. We then spent time with some students, listening to music, playing pool and some of us even gardened with them. That night we slept in the chapel of the church and woke early to visit the Burlington Farmer’s Market and later Shelburne Farms. When we got to the “Farm” we were surprised how big it was. From the shore to the rocky lake cliffs you couldn’t see the other side of the ever expansive fields of green grass. We camped in a small cave of woods up from the road, and met the groundskeeper, a descendant of Cornelius Vanderbuilt. He told us the story of the farm and how it came to be a non-profit organization and teaching farm. The following day we arrived at the Lake Champlain Waldorf High School, where we met Rosa Dews, our semester mate who had gotten injured on the winter trail. She had a knee operation in April and is now on her way to healing. Rosa’s mother, Bet, is the Life Science teacher at the Waldorf School and she taught us about flower biology and botany. The next morning we joined the 11th grade class for another interesting botany lesson. The visit to the school was topped off with pizza and ice cream. All of the faculty and students were incredibly hospitable to us and gave us a fun time. Thank you Bet! Thank you faculty and students! We now were on our way to Barn Rock Harbor, where we stayed for three nights. From there we visited the Maritime Museum to see where our boats came from. We did some conservation work in the lab there as well, scraping rust from Revolutionary musket shot. Solos came and went, and I cannot say how it was for the others, but it seemed that everyone was in high spirits about it. We fasted for 24 hours and had the fires listen. Although my solo was meditative I got bored pretty fast and was spooked by the dark woods a few times. When we got back Emily and Zack had made a feast for us of bread and soup and chocolate biscuits! Days of rowing brought us to the Narrows of Dresden, the thinnest part of the lake, where it is hardly a lake, but a swampy river moving to nowhere. That day was our only inclement weather in which it rained good and clean. For our last camp we perched on a muddy cliff in a grove of beech, sleeping to the sound of railroads and night winds. By 6 AM we were back in our boats rowing to Lake Champlain Canal Lock 12 in Whitehall NY. The locks are huge yellow vault doors that granted us entrance and let us rise in our boats over fifteen feet to the canal elevation, over a distance of two hundred feet in seven minutes. 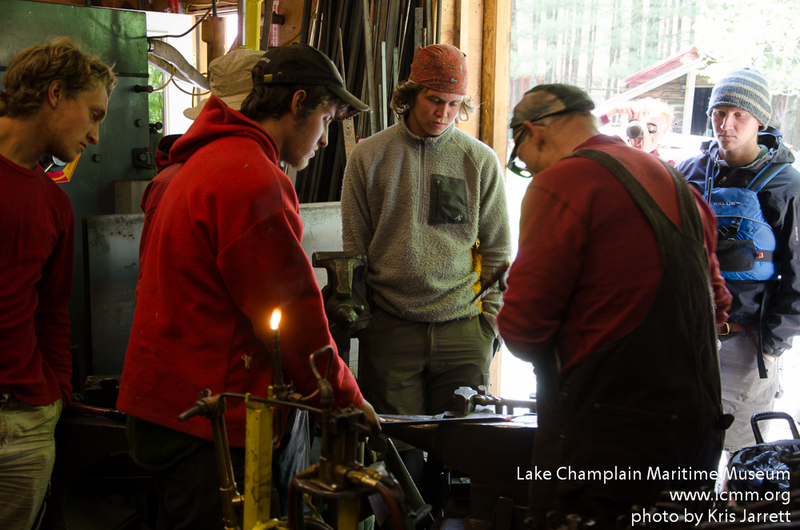 Passing through the other end to the Lake Champlain Canal, we completed our journey of the lake and it’s treasures. We arrived at a park in Whitehall and greeted Lisl, who brought a different treasure, food and stories. Fresh bagels, milk and yogurt from Kroka’s cow Daisy as well as cheese and Russian sausages made a holiday of eating. From here on only twelve more days away we will cross paths, dear readers, with base camp at Kroka once again. And from there only one more week till we see YOU. Till then we will be bicycling and experiencing the last adventures of our journey. Hasta la vista, Max Rubin.